Apple CEO Steve Jobs stands under images of the iPad 2 at an Apple event in San Francisco this evening. APPLE CEO STEVE JOBS, currently on indefinite medical leave from the company, appeared at a special event in San Francisco this evening to unveil the iPad 2. Jobs said: “We’ve been working on this product for a while and I just didn’t want to miss today”. The new iPad has a faster processor, however its battery life won’t be any different to the iPad, at 10 hours. It will also retail in the US at the same price ($499). 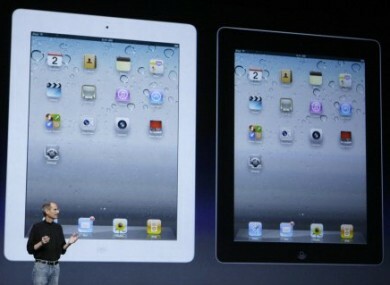 The iPad 2 is lighter and thinner than the original version – at 8.8mm it will actually be even slimmer than an iPhone 4. Jobs said it would be available in the US on 11 March and from 25 March in other countries and it will be available in black and white from those shipping dates. The new iOS 4.3 operating system will help Safari run faster and adds iTunes home sharing features to allow users to play music, games and TV shows on a range of their Apple devices from their iTunes library. Apple says it also includes enhancements to AirPlay so users can stream content from third-party apps and sites to your TV. One particularly interesting feature of the new operating system is that it will transform an iPhone 4 device into a WiFi hotspot. It will facilitate a data connection with “up to five devices in a combination of up to three WiFi, three Bluetooth and one USB device”, Apple says. Apple also announced that publisher Random House would make its entire US catalogue of 17,000 ebooks available on iBookstore. The catalogue includes bestsellers from authors such as Stieg Larsson, Dan Brown and Cormac McCarthy. Customers will also be able to pre-order upcoming releases from the publisher. Over 100m books have been downloaded by Apple iBookstore users in less than a year, Apple says. Email “Steve Jobs unveils Apple’s iPad 2”. Feedback on “Steve Jobs unveils Apple’s iPad 2”.